With expertise in domestic and commercial applications, and a choice of brands renown for quality and reliability, we can recommend a system to suit your needs and your budget. Our range of products include gas ducted heating, refrigerated split systems, add-on ducted systems, and evaporative cooling. 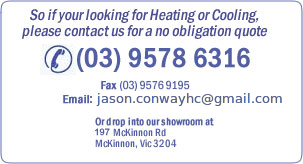 Come into our showroom and see our full range of products including working models of refrigerated and gas ducted systems.